DMY is back in town! 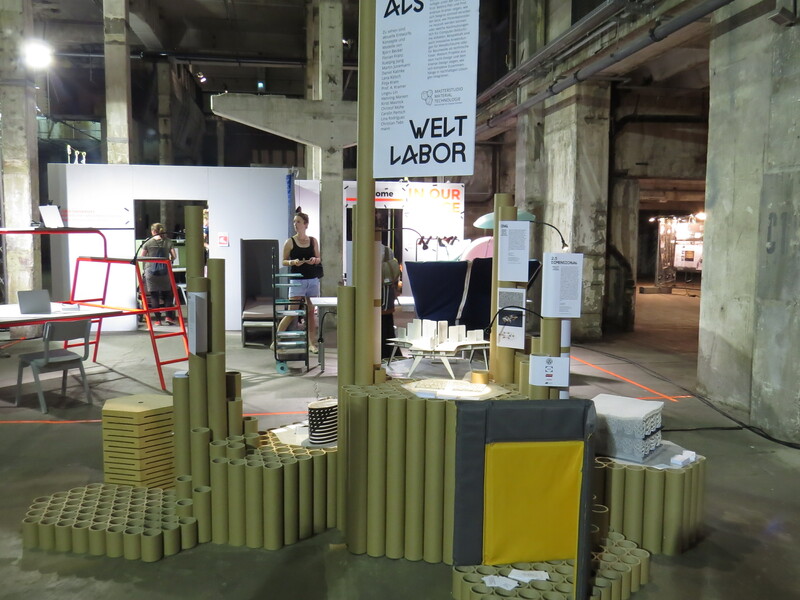 Last weekend, the 14th DMY International Design Festival took place here in Berlin. And DMY’s core event – the big design exhibition – returned to Kraftwerk Mitte in Köpenicker Straße. Kraftwerk Mitte is an old power station which hosts various events and exhibitions and is also the location of famous techno club Tresor. 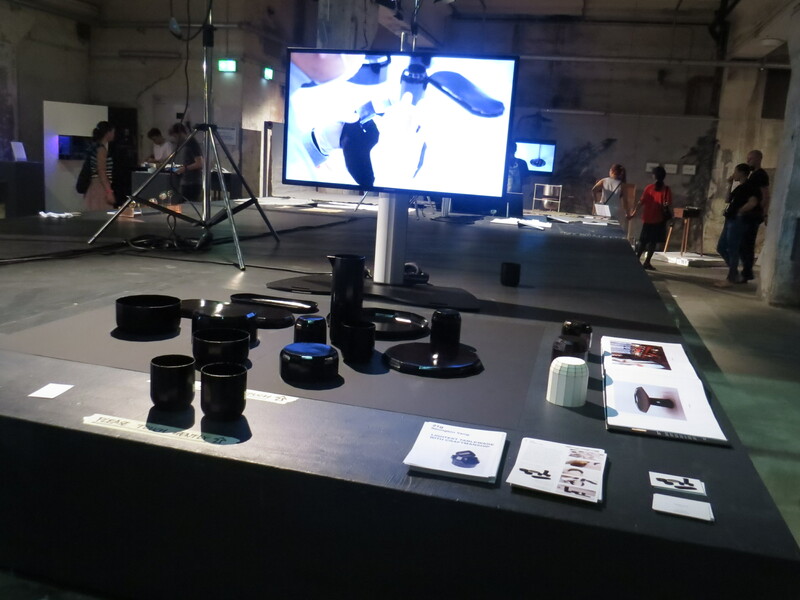 If you are interested, here are my articles about DMY 2015 and DMY 2014. 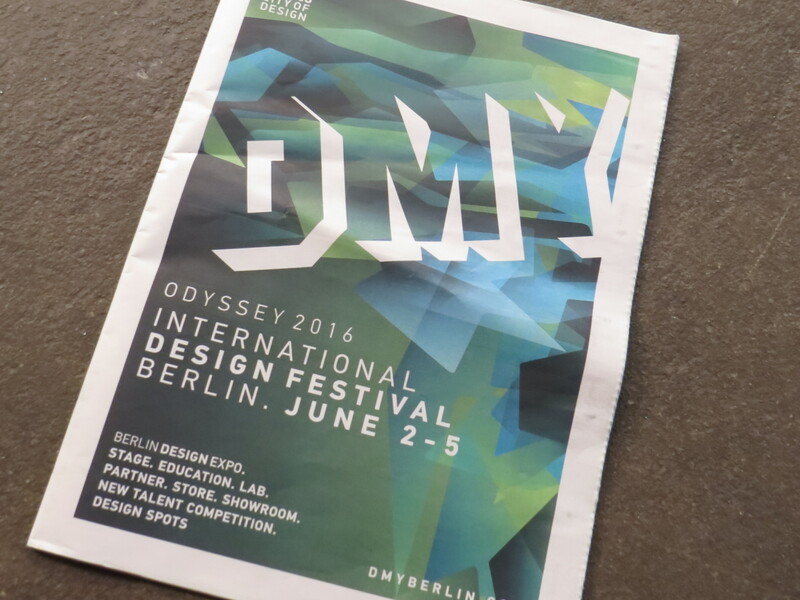 For 2016, DMY’s organizers had decided on the festival motto of “Odyssey 2016”: the boundaries between the different design and art disciplines are becoming increasingly blurry; they are starting to fluctuate– between digital and analogue, online and offline; between architecture and social movements. And yes, there might be a loss of orientation (this is where the Odysseus reference comes in) but it is precisely this lack of definition which makes the journey so exciting. And this is exactly what I felt when I walked around the exhibition halls: so many cross-boundary design concepts and materials; innovative ideas which could have come straight from a Sci Fi or Cyberpunk novel – it was quite exhilarating. Particularly the “Education” and “New Talents” sections! 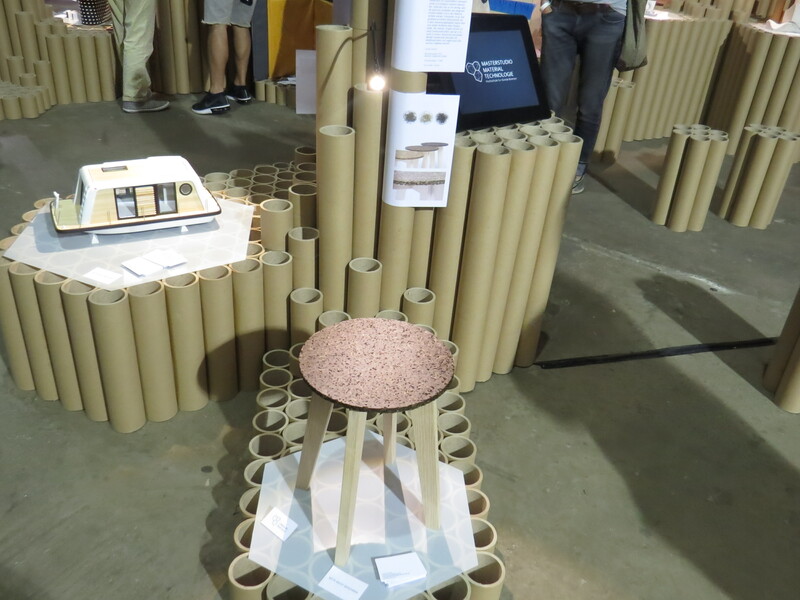 The central exhibition of DMY International Design Festival 2016 featured the following main sections: Education (design schools and universities presenting their student/graduate projects), New Talent Competition (up-and-coming young designers), Berlin Design Expo (a special showcase for young design labels from Berlin), Showroom (innovative products) and Lab (creative projects and design concepts). And, as always, DMY was accompanied by a varied program of performances, open talks, events and presentations which took place in Kraftwerk’s lecture theatre. And here, in no particular order, were some of my favourite designs projects at DMY 2016. The ground floor of Kraftwerk was dedicated to Education, a space for design universities and schools from Germany and Europe to present their students’ current projects. Exhibitors included Design School IED from Madrid, the Industrial Design department of the University of Applied Sciences in Berlin, Lund University School of Industrial Design from Sweden, and the Hochschule für Künste in Bremen, the University of Applied Sciences in Osnabrück and Dessau Department of Design from Germany. 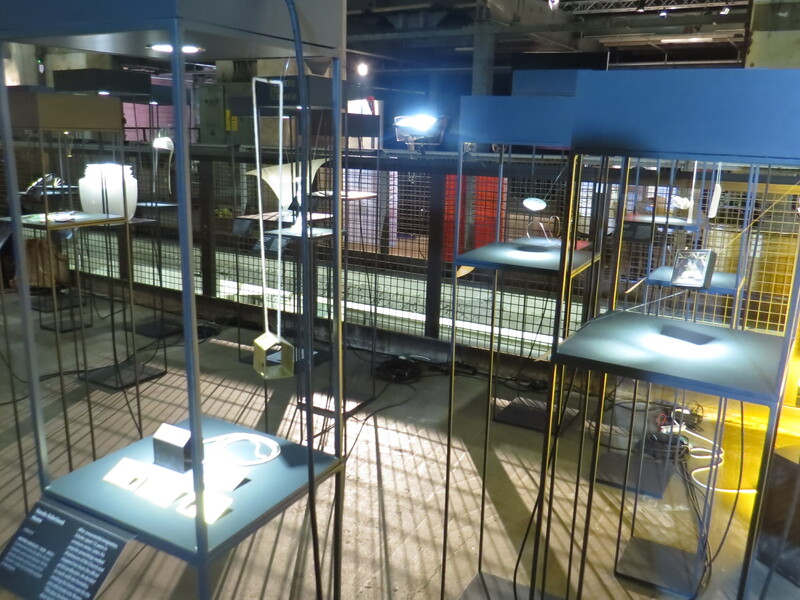 “Future Lab”, the industrial design showcase of Berlin’s University of Applied Sciences (Hochschule für Technik & Wirtschaft), was particularly interesting. 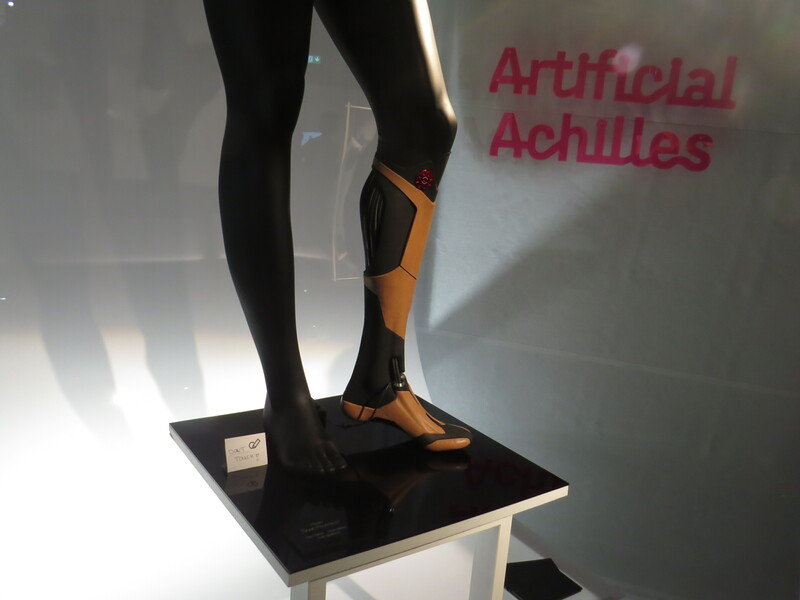 There were some fascinating concepts to discover: Artificial Achilles, for example, a project by Felix Winter and Paul Raths. Winter and Raths have developed a concept to improve the performance and comfort of prostheses (artificial limbs): artificial muscle strands created from carbon-based aerogel material which can contract and expand like a real muscle. These artificial muscles are controlled by electrodes which are applied to the existing nerve endings of the leg or arm stump and, in theory, could be operated by nerve impulses just like a natural limb. Sort of a symbiosis between humans and technology. Very cyberpunk! 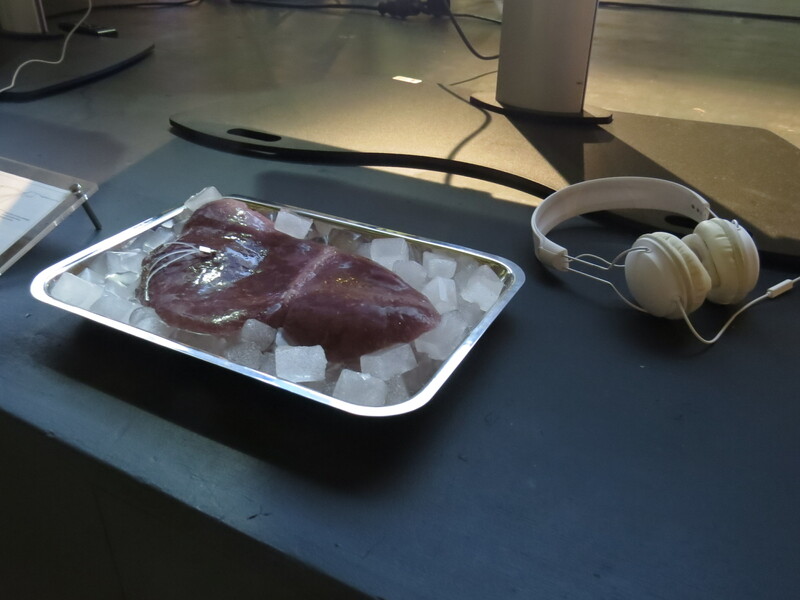 Another Future Lab project was Meat the Future which presents an alternative to conventional meat production: how about growing your meat in-vitro?! With animal stem cells on an industrial scale. There was a small model which showed what this production process could look like. And yet another cool Future Lab projects was Rapid Protobiking which illustrates the concept of crowd production (a flexible, decentralised product manufacturing process). Create a completely personalized bicycle by selecting the components online (material, design, colour, accessories). 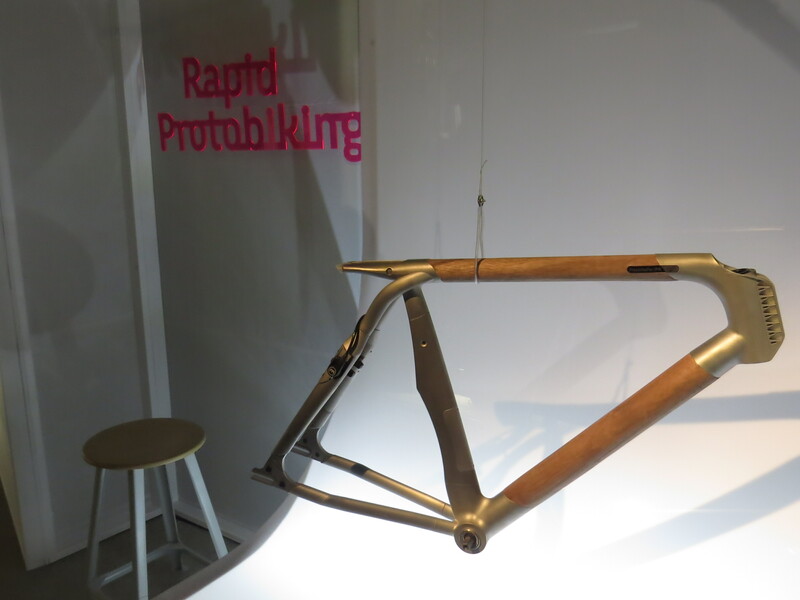 The bike design is then printed on a 3D printer. The Masterstudio Material und Technologie of the Hochschule für Künste in Bremen presented its projects under the headline “Design as World Lab”. 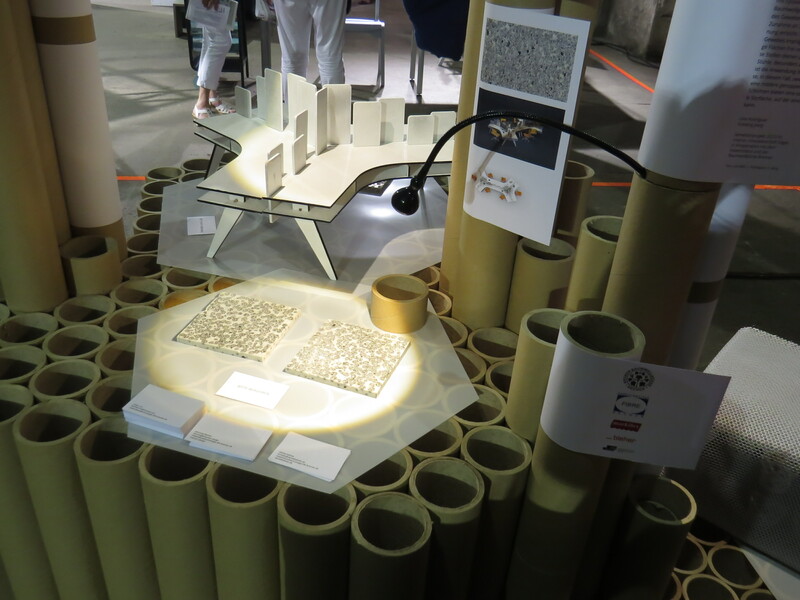 They showed several innovative raw material concepts – “Seegrass”, for example, show how plant waste can be recycled to create new material: the chair seat in the picture below is made from pressed algae. A novel kind of aluminium hybrid foams which was developed in cooperation with the German Fraunhofer Institute can be used to manufacture light and portable room elements and dividers for open-plan offices. And cotton fibres can be merged with the biodegradable thermoplastic material PLA to create a new and versatile raw material. On the first floor of the building were the New Talents, Showroom and Berlin Design Expo sections. I saw some fabulous exhibitors, like Flowers from Slovakia. This design project was initiated in 2011 with the goal to promote the cultural heritage of Slovakia and its traditional arts and crafts through contemporary product design. You can find more information about the on-going project here. This particular collection, the third edition within the Flowers for Slovakia project, is all about jewellery: 20 young designers and jewellery makers have created objects which honour outstanding figures in the history of Slovakia. 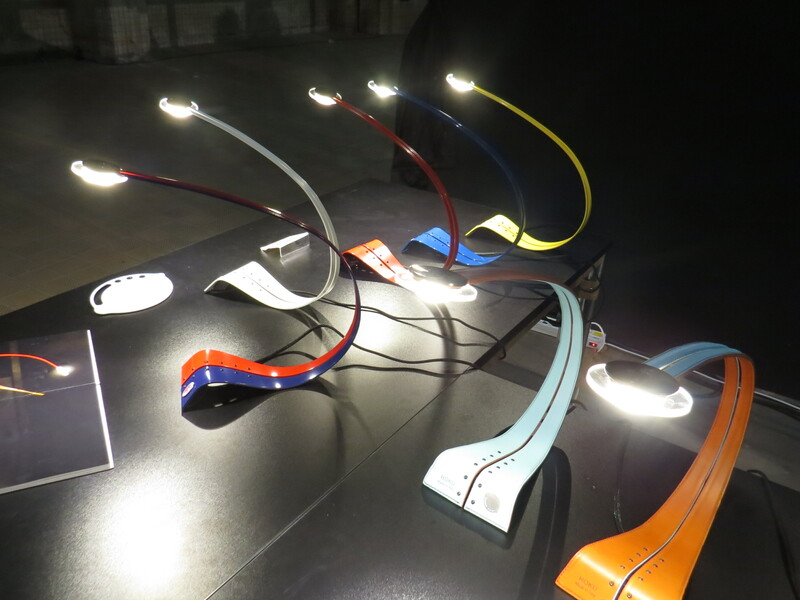 Another interesting design company was Lime Lab from Italy and their striking Hoku desk lamps. Lime Lab was founded by product designers Stefano and Roberto Carisi: the Hoku lamps recreate daylight and they are available in a variety of materials and colours – fabric, leather, paper, metal. I love the fluid and elegant design of these lamps (picture above). 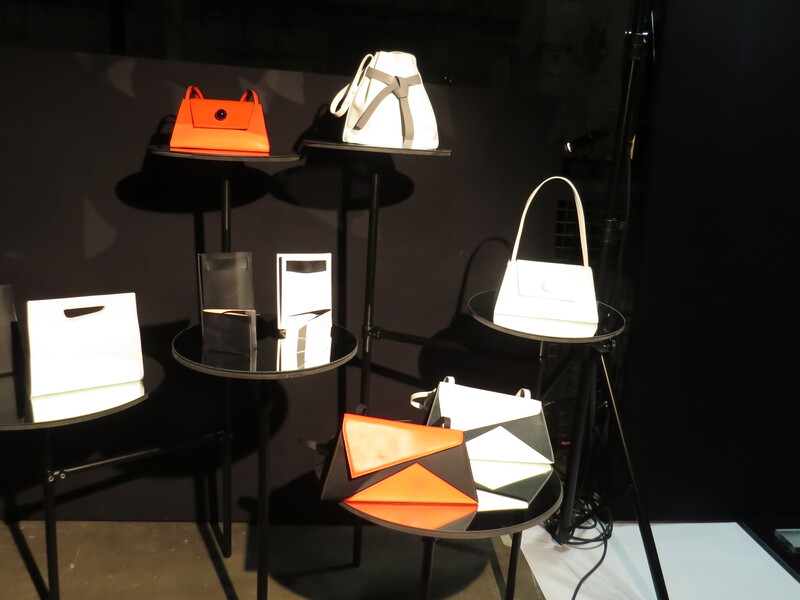 Kitayama Studio from Beijing, China, creates beautiful leather bags and accessories – clean lines, high quality material and ultra-stylish designs – and Royal Foil by Berlin-based designer Aya Zehavi is tableware from aluminium foil. 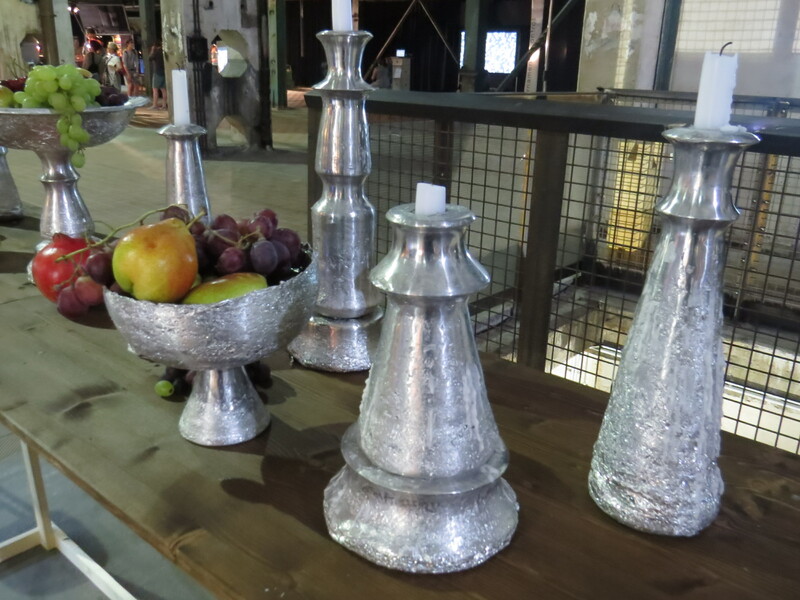 Viewed from a distance the cups, vases and candlesticks really look like they are made from silver. And now for something completely different: The New Talents section! 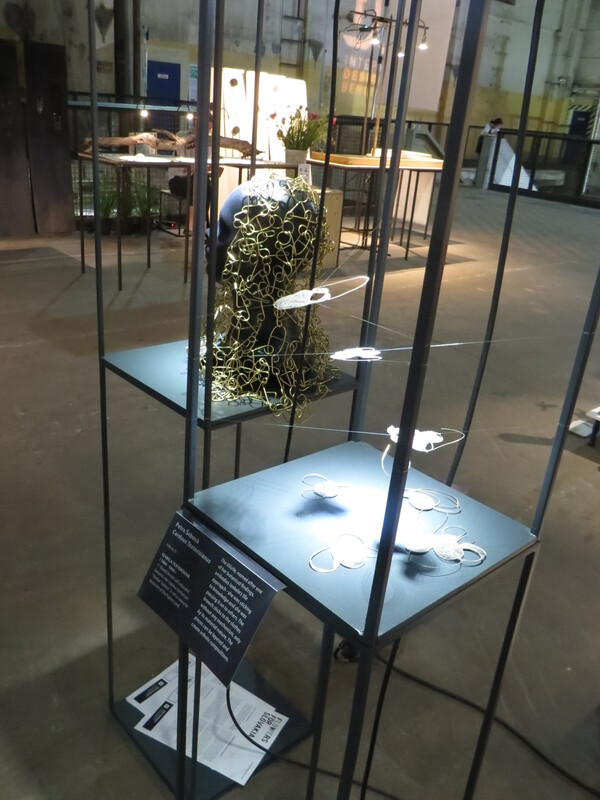 This part of the exhibition featured the winners of DMY’s annual New Talents Competition: 25 young designers from twelve different countries. First up: Anthropomorphic Sensory Augmentation by Lesley-Ann Daly from the UK. Imagine if you could listen to your body, follow the process of your liver, check on the nutritional elements that you are ingesting whilst eating, for example, or monitor the toxicity levels in your blood? Well, the advancement of wearable tech and human modification technology means that you might be able to do this at some point in the future! Lesley-Ann presented three possible prototypes for ultrasonic intra-body communication devices: a Toxicity Monitor which would be implanted into the liver, a Cardiac Monitor (implanted into the heart) and a Nutrition Tracker. The “earphone” is a tiny chip implanted into your ear. 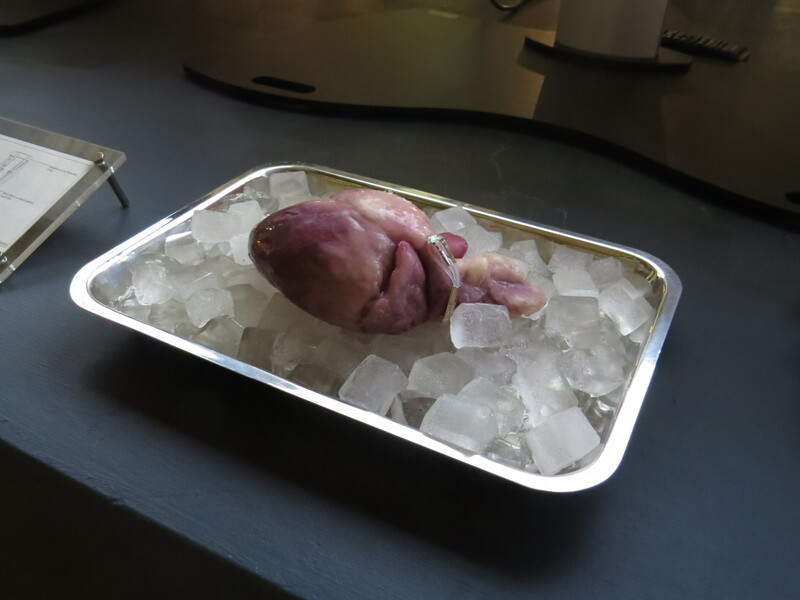 Check out the organs placed on beds of ice cubes! They’re made from silicone, of course, but even up close they looked surprisingly convincing. Another visually striking UK project was Independent Labour by Anne Vaandrager: she has designed a Birth Box for people without access to medical aid or hospitals. The Box includes everything you need to supervise an (uncomplicated/normal) home birth – there are tools and instruction leaflets with easy-to-understand diagrams on how cut the umbilical cord and so on. Genius! Seungbin Yang from Korea came up with a modern twist on the traditional Korean craft of creating lacquerware. The process of creating lacquer items is very complicated, long-winded and expensive. As a result, the technique is becoming increasingly rare in Korea as the older generation of craftsmen are retiring. Yang has brought out a modern version of this lacquerware: instead of wood he uses paper as a base. The layers of lacquer are still applied and polished by hand but the objects are light and easy to handle. And they look beautiful, too! 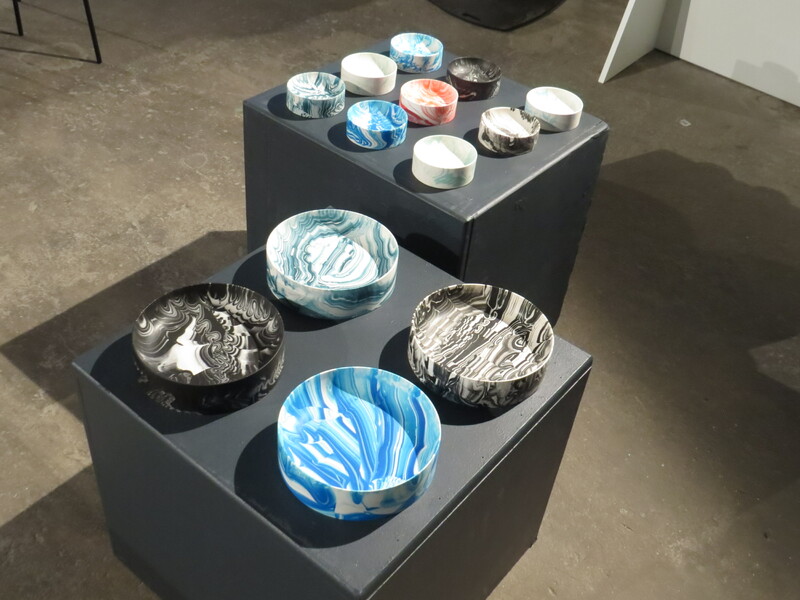 Another striking exhibit was Poured Bowl by Troels Flensted from Copenhagen. The mixture of water-based acrylic polymers, pigments and mineral powders is hand-cast: as the material is flowing into the moulds it forms unique, colourful patterns. And finally, Wearing Water by Nacood Lab, a Japanese design studio based in Berlin and London. Shiori Aiba and Maasa Yamanashi design and create fabrics and accessories from Japanese washi (rice) paper. Although this paper looks fragile it is surprisingly durable (in traditional Japanese houses it is used for folding screens and windows, for umbrellas and other everyday objects). 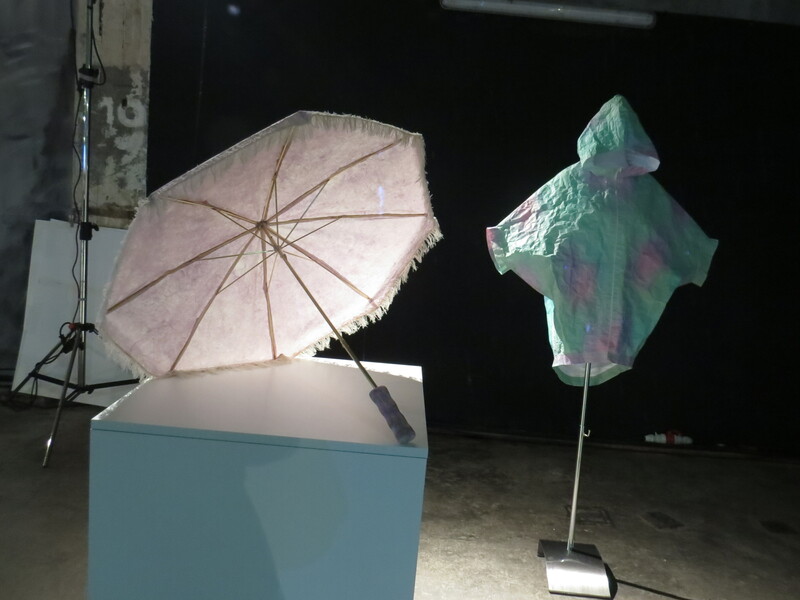 The rain poncho and umbrella are made from specially treated washi paper, they are water-resistant and, as you can see, the colours are beautiful.